One of these bulbs is not like the other. One of these bulbs just doesn’t belong… The good news is my father’s fifty-year-old chandelier has just entered the 21st century… invigorated with LED bulb tech. It’s like the Guardian of Forever on “Star Trek.” Sitting there… as time streams about it, causing its fourteen bulbs to randomly fizzle. As a boy, I always felt like a day wouldn’t go by when one of these old school incandescent bulbs blew out. In the chandelier’s early years, my parents happily fed it with a fresh supply of tiny candelabra bulbs. But recently, I’ve taken over the responsibility to maintain this relic. My dad is quick to whip out his cell phone and call me every time one of the little 15-watt flames burns out…! For example, the Sony cassette player from his ancient sound system was just fixed for the billionth time. Actually, the repair shop gave him a new ‘used’ unit instead of attempting to rebuild the old monster. I’d say over the last half century, the Lester family has literally screwed in over 2,600 bulbs into this freaking chandelier. It was time to make a change and find a more permanent lighting solution for the dining room. You know I have a soft spot for shiny LED tech. Unfortunately, as I started to shop around on Amazon, I realized there wasn’t a lot of choice out there for this kind of replacement bulb. Though frustratingly fragile, little candelabra incandescent bulbs with their tiny bases are actually quite elegant. Their simplicity is difficult to replicate with the additional guts baked into the LED structure. 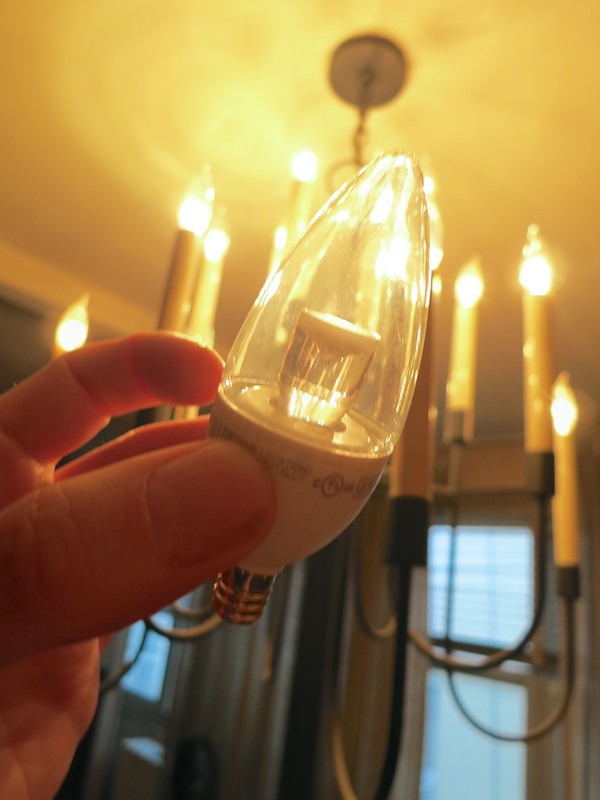 The closest I found in form factor was GE’s Energy Smart Bent Tip LED. But this handsome replacement costs $15.21 per bulb! That’s a huge jump in price from the standard GE incandescent 12 pack we’ve been buying. The short-lived beasties are easy to forgive when they net out at just over a buck a bulb. As I pondered the value proposition of an expensive LED bulb replacement program, I thought I heard the evil song of the ‘incandescent bulb sirens.’ It gently compelled me to continue throwing dollar bills at our chandelier from hell. It’s thirty bucks for a six-pack. We’re talking five bucks a bulb. That’s still a crazy jump in price compared to Thomas Edison tech. But it’s a ‘permanent’ fix. It doesn’t have a matching bent tip. It’s built with a stubby, white base. I decided to simply ignore the problem and rationalize it as a transitionary limitation! One day soon, my replacement program will be complete, and uniformity will be restored throughout the chandelier. 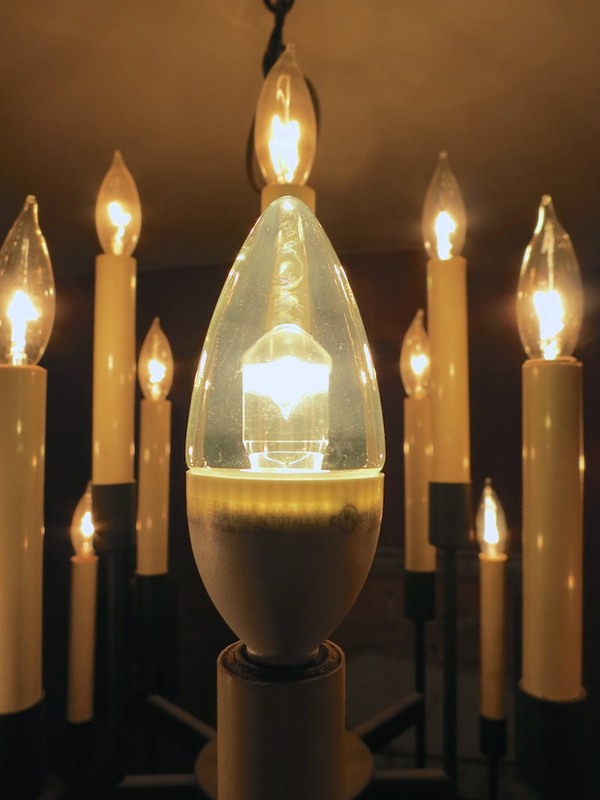 Would my father actually buy into my evil plan to fuse LED tech onto his 1965 chandelier? I stepped back and looked at the ugly duckling. Its light quality matched the others. But who was I kidding…? It still stuck out. Oooh… maybe this wasn’t such a good idea after all. I turned to my father. Did I mention my dad’s vision isn’t quite 20/20 anymore?